When legendary rock & roller Chuck Berry passed away in March at the age of 90, it was just a couple of months after he had announced that he had recorded his first new album in thirty-eight years. Released posthumously, that album, Chuck, turned out to be an astonishing artistic statement.His twentieth, and final, album stands with his best work. Chuck Berry was the father of Rock ‘n’ Roll. He showed that songwriters could perform their own material and that changed the entire playing field. Without Chuck Berry, rock music might not have survived past the mid-1950s. He took the foundation laid out by Louis Jordan and came up with the blueprint for the musical style that dominated the next fifty years. 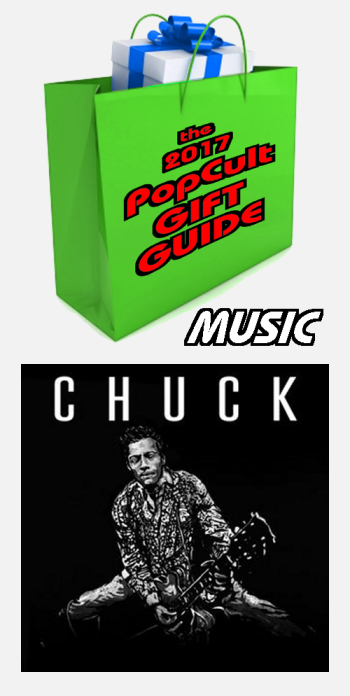 We had never had the chance to experience a rock & roll album recorded by a 90-year-old man before, but the music on “Chuck” does not betray its creator’s age. With musical support from his sons and daughters, Chuck Berry delivered an album that proved he could not only rock like he did in the old days, but also create excellent music in different styles such as country, jazz, reggae and he even treats us to a spoken word, film noir epic in the song, “Dutchman.” We get straight-up Chuck Berry rockers in “Big Boys” and “Lady B Goode,” bluesy numbers, ballads and more. Chuck is a truly remarkable final chapter in the musical legacy of a man who had already earned immortal status among the gods of rock & roll. You should be able to find it at any retailer who sells new music or order it with special vinyl/T Shirt and other bundles directly from Dualtone Records.